I promise in 2016 to take better care of my health. I’ve got to lose weight; and I’ve got to eat better. Beyond that I will enjoy life day by day and make the most of my hobbies and passions. The funny thing is, after a lifetime of striving to build and develop for “the future”… I realize that the future is now. It’s a change for me, to live for today, and not for tomorrow. Do I know how to do it? I’ll share a couple of my projects for the New Year below. Since we got our young girl Cedar we’ve been video-taping our ongoing training, subscribing to Marsha’s Two Minute Dog Trainer methodology. It is my intention to take a fairly extensive body of work from the pages of The Joker’s Notebook and create a compendium publication with links to YouTube videos which give a visual reference to the training. I got a chuckle the other day when going through the videos and found more than one of me in my robe doing early morning training with Cedar. That’s the reality of dog training. You don’t always get dressed up like you’re going to be on camera. Sometimes you just throw on the morning robe and go get ‘er done. Not to brag, or anything, but the Joker’s Notebook is a comprehensive reference for teaching a dog independent performance in agility and the perfect foundation for an amazing distance dog. A chief passion for me for the last several years has been to build a league of franchise clubs that run the same course or play the same game in a league format. The league finally has some traction and is slowly (oh, so slowly) growing. 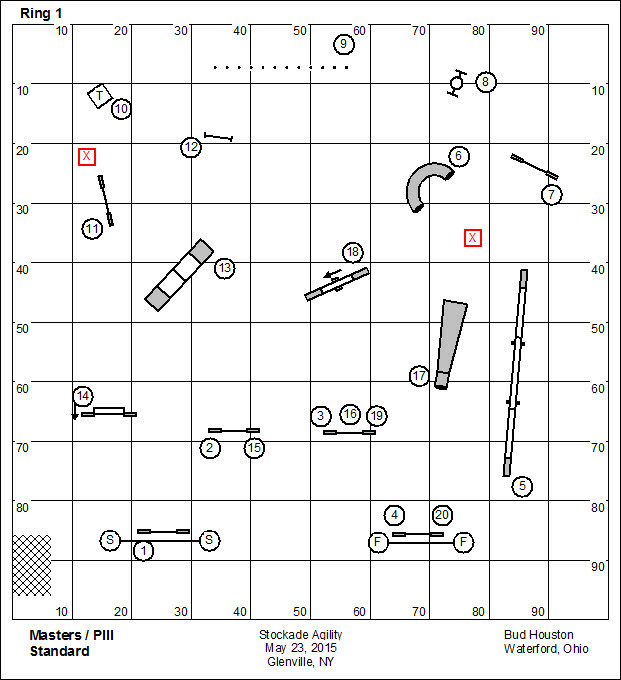 The first game we’re going to play here at my place in 2016 is the course set for a 60′ x 90′ space. In the 60×90 we’re getting away from the “international” grind into something more lovely and flowing… but certainly with some challenge. This should be a lot of fun! The National Dog Agility League is gearing up for a new year. We have been tantalized with the prospect of a NatGeo program in early 2017 based on our championship series. The program will be based on the players who support the league. The first quarter series is actually three separate leagues based on a) size of the floor and b) difficulty of the challenges. If you design a course with a very low Q rate it possibly says something significant about the design. Maybe it’s too technical and should be reserved for a Masters Challenge class. But looking back at the course I cannot really spy the painfully technical bits. You tell me! It’s clear that when designing a course I see myself in the context of that design; I mean, me as handler and competitor (as opposed to me the unrelenting design Grinch.) This means that I design for an old guy with arthritic knees who runs a dog with really excellent independent performance skills. As a practical matter most sequences will fold back in on themselves, allowing me to move from control position to control position while allowing the dog to work at speed. 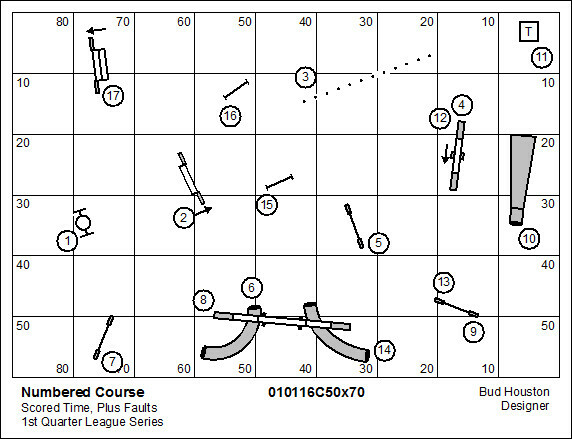 On the course map I’ve marked two places I know I have to be to give good direction in a technical moment. The first “X” solves the #6 pipe tunnel while the dog is faced with three options on the dismount of the dogwalk. 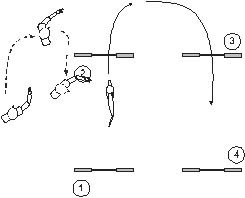 The second “X” solves the modest backside approach to jump #11. I had the pleasure to judge Wendy Cerilli at this trial. Understand that I was witnessing a legend in the making here. Wendy runs TEN Aussie dogs… in every class. If you grasp what this means… this is no wimpy AKC trial with two runs a day. This is the USDAA where the big dogs play. That means Wendy was in the ring 50 times a day. The fun thing is that she used the same handling plan with all dogs; with considerable success, mind you. This made it easy for me to understand and predict my judging position, even in the dog’s choice games. I’ve had the luck to judge many legendary figures over the years. I’m tickled to add Wendy to that list. Fran Seibert came out to the trial site just to say hi to me. Many of the real heroes in this sport are folks who’ve run agility schools since the early days of agility in this country, and have introduced hundreds and hundreds of people to our sport (like Zona at Rocky Mountain Agility out in Denver; Terry Bessler out in South Dakota; and dozens of others around the country). You can put an asterisk next to #3 with the notation: Nothing straightens the line like the certainty in the mind of a well-trained dog. Okay, my analysis of why the Q rate was so low on this course. The “Laws of a Dog In Motion” fundamentally describe a context for handler discipline and timing. It was early in the trial. People were still tight and more than a bit nervous. A minor error, the tic of a bar, half an inch outside the yellow, a bobble in the weaves … it doesn’t take much to elude the Q. In fact, the players at the Stockade trial were amazing to watch, and brought considerable skill and grace to the field. Reminds me of why I love dog agility. Lisa Barrett ran a little Toy Poodle named Giddy Up all weekend. This little dog was amazing, yipping and digging her nails into every moment, attacking the course with every ounce of her little body. Lisa is an accomplished handler who understands every nuance of handler movement and pressure. Together the two were a show for the big tent. I continued working with our young girl Cedar when I got home. We’re getting her ready to raise hell at the TDAA Petit Prix this year. And you need skills to survive in the little dog venue. Our space in the basement isn’t really all that big. I’m antsy to get out in the training building and put together some of the skills we’ve been working on. But don’t you know we’re living through the Blizzard of 2015; so I’m content to continue in the basement until the world thaws out a bit. I’m about ready to bring in another set of 2x weave poles. Cedar’s intro to weaves is about six months earlier than I did with Kory. But she’s like a learning machine and I thought… what the hell, why not?! This has a bit of a Teacup flavor to it. And indeed we intend to show her in the TDAA. But I would like her to excel in other flavors of agility as well. The TDAA sharpens the handler’s timing and awareness in a way that none of the big dog venues can accomplish with a small dog. An important mission of the TDAA is to give the small dog handler a taste of timing skills that handlers of big & fast dogs have to master for day-to-day survival in the big-dog flavors of agility. Play in the TDAA is not for the faint of heart. We continue to record Cedar’s ongoing foundation training. She has just turned 6 months old. I’m happy to report that she weighs 18 lbs and measures 15-1/2″. That’s a perfect small-dog size for play with any agility organization (including the TDAA). Cedar is a dog who has never had a meal in this house without “working” for it. I’m sorry that we haven’t captured every grueling moment of the training. It’s hard for any person with novice dog training skills to understand the meticulous detail of training; which is a matter of vision, objective, and patience. We’ve dragged the agility table into the basement and this morning began the foundation for Table Down. The objective is to be able to send her to a table where she will promptly assume a down position. This is a method I documented some 15 years ago in the pages of The Just For Fun Agility Notebook (also in the book I co-authored with Ruth Van Keuren, The Jr. Handler’s Training Guide). When working with a dog I rely quite a bit on free-shaping. This means I am not much of a fan of luring or targeting. And yet this exercise has a bit of a lure in it. Once the dog is on the table I’ll give the verbal command “Lie Down!” and drop my fist to the table. My fist will have a bit of kibble in it. And as all dogs have x-ray vision, she’ll be studying my hand, trying to figure out what it takes for me to open it, and give her the treat. Ultimately the dog will belly down to study the problem… whereupon she has met my criterion and will get the treat. You’ll note in the recording that in several reps she figures out faster and faster what she needs to do to get me to open my hand and give up the reward. I’ll share the progression of this training method as we go along. I’d like to share with you a couple short recordings of Cedar’s early Back Pass training. 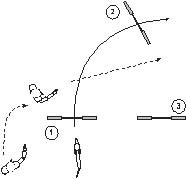 Right now I’m teaching a clockwise Back Pass, and I use the verbal “Come By”. I reckon I’m ruining any herding career… but that’s no major loss. I teach this initially by luring around my body with a food treat, while giving the verbal command. This soon becomes a draw with my lead… maybe even a flick of the arm. Gradually I relax the physical cue until it turns to verbal only. I would probably record more. But don’t you know this is meal-time training. Frankly, sometimes I’m in my robe and big fluffy slippers. And that doesn’t make very attractive video. Marsha makes the point in one of the recordings that Cedar is a dog who has never had a meal just plopped down for her to eat. From the moment she came into our house she has worked for every bit of every meal. This is the essence of the Two-Minute Dog Trainer. This protocol makes her keen to learn and anxious to offer performance to earn her meals. When she’s young she’ll learn skills that she’ll hold for life. You might wonder why I’m teaching this skill. It is certainly not very common in the agility world. I maintain that in another ten years it will be a common skill. The agility world “at large” hasn’t much discovered it yet. Consider these qualities: When calling the dog to a Back Pass the dog drops completely out of obstacle focus and into handler focus; and, it allows the handler to perfectly set the corner of approach to the course. I’ll leave you to mull over the consequences of these attributes. The other day I had a remarkable session with Cedar in which I gave her a series of 9 Left and Right commands, and she spun the correct direction each time. Then I handed over the job (and the treats) to Marsha, who conducted the same experiment. Cedar’s success rate plunged to around 50%. What do you think that was about? I have this idea that maybe I have a subtle “tell”. Cedar has become expert at reading my tell and promptly follows this reading to tell which direction to turn. For many years I studied what I call “phantom” movements; that is, the dog follows a cue that the handler isn’t aware that he’s given. There’s a phantom Blind Cross and a phantom Front Cross… even a phantom Tandem Turn. Most physical cues that we give actually have a complicated chain of physical events which lead eventually to the substantial cue. The dog becomes expert at reading that chain and begins working backwards, down the chain, to take the cue on a precursor event. Of course, I’m actually engaged in teaching Cedar verbal cues rather than physical cues. It makes me believe that no matter how much I’m endeavoring to put the performance on a verbal-only cue my body can’t help but give a helpful twitch that betrays my intent. I brought our teacup teeter into the basement this morning because it’s time for Cedar to get her introduction the obstacle. You’ll note that I don’t spend a lot of time on a tippy board or a Buja board. I want to see right off the bat how she deals with the movement and noise. If I go to a tippy board it will be for remediation. I’m a little surprised, looking back at it, how much I had to say on the topic. With any luck, all of that is in my mind as we bring a new dog along in her training. I note that there’s a picture of my old girl Hazard (when she was young) in the blog post. She’s getting an introduction to movement under her feet with a foot pedestal that rocks back and forth. Marsha, armed with a clicker and food treats, has had Cedar in the living room on that very same pedestal in the last couple of days. So my protestations about disdaining intro/training devices should be taken with a grain of salt. When teaching a dog absolute directional I begin by luring her into the turn while giving a name or command to the performance. Gradually I stop luring… and indeed I stop giving any physical cue at all. Ultimately I want the dog to understand the performance based on the verbal command only. Then, for the longest time, each session will focus on a single direction. You can hear Marsha in the tape explaining how I deal with Cedar’s choice of turning direction. If she gets it right, I praise her and give her a bit of food. If she gets it wrong, I briefly turn my back on her, just to make an emphatic point. There’s nothing complicated in the pattern of my commands at this point. I do “Right-Right-Right” then “Left-Left-Left”, and repeat. When she’s getting it right in the 80 percentile range, I’ll start using more complicated patterns. http://youtu.be/ZVEhSkitJ7Y ~ Thanks to Brenda Gilday for the recording. It strikes me that in about a month I will write my 1000th web log. When I started this I ran a big training center, doing six or eight camps each year. I was out in the world doing a lot of seminars, and on many weekends showing my dogs. I lived agility pretty much every waking hour of the day. The pace has certainly slowed down, mostly because I’ve slowed down. Arthritis has brought a premature end to my campaigning days. My boy Kory is almost constantly lame these days, though it’s a bit of a phantom condition that comes and goes almost at whip. And I don’t much feel an urgent need either to cure him or rush out and get another dog. The Teacup Dogs Agility Association keeps my brain in the sport. It’s not a big titling organization compared to just about any other. But it is honest and challenging and provides a modest income (add to our “landlord” income, and at least we have a roof over our heads). Early next year there’s a group of agility fans who will descend on us for a “Training with Bud ~ old-timer’s camp”. The camp is being organized by the notorious Sue Sternberg, one of my favorite students. That should be fun. I’ll see if I can still make them cry. It’s about time for me to take the exercise into the back yard to give me a bit more room for the send. A Tandem Turn is a cross behind the dog on the dismount of an obstacle, or on the flat. Contrast this with the Back Cross, which is a cross behind the dog on the approach to an obstacle. An experienced handler will try to be positioned on the side of the turn because the dog turns most naturally towards the handler. The clever and evil judge may design a course that intentionally traps the handler on the wrong side away from the turn. The handler needs an answer to that riddle. We rely on the premise that our dogs already understand how we move. So in the Tandem we turn towards the dog, distinctly and boldly. The dog, understanding our movement should make the turn in this new direction although the turn is toward his side. This illustration shows the “off-arm” Tandem. As the dog comes up over the jump the handler brings up his opposite arm, pointing out in the direction of the turn. Of course, the turn is more than just an arm signal. At the same time the handler is rotating his body, turning, and moving in the direction of the turn. It’s also a good idea to develop a verbal command to coincide with all of these other cues. The handler’s position should be only slightly forward of the dog for the dog to see the cues for the turn. At the same time the handler should not be so far ahead that he can’t step behind the dog (it is a form of the Rear Cross, after all). Which arm should be used to signal the turn is a bit controversial. It’s reported that Susan Garret calls the counter-arm Tandem the “evil-Ohio-arm,” and advocates using only the inside arm (the arm nearer to the dog). The inside-arm Tandem was originally shown to me by a lady from Los Angeles (Barbara Mah.) I thought it looked so silly that for a long time I called in the “La La” turn. However, I discovered that one of my dogs, who I’d been struggling for over a year to teach the off-arm Tandem, understood the “inside” arm immediately. He got it the first time he saw it, and made the turn perfectly. So, I no longer call it the La La turn. This is now the Inside-Arm Tandem. All the other elements of the turn are the same. The handler should rotate his body, turn the corner, and move in the direction of the turn. Oh, as to the controversy about which arm to use: we’ll use the arm that our dog implicitly understands. There are no “one size fits all” solutions in agility. The Tandem Turn should always be learned with practice. Some dogs respond to both signals, but give a different response to each. This illustration shows a scenario in which the turn is still away from the handler’s position, but the true course is the gentler path up to jump #2. I would always use the inside-arm Tandem in this situation. I had a dog (Bogie) who always took the off-arm as a “hard and deep” instruction. He’d flip back to jump #3, giving jump #2 a pass. He’d interpret the inside-arm Tandem as a gentler turn, and would be, properly, directed to jump #2. These aren’t hard and fast rules of the performance. The handler should experiment with both arms and understand the dog’s response to each. Know thy dog. The Tandem Turn can be used on the dismount from technical obstacles, on the exit of a tunnel. The biggest danger is that the handler’s turn mightn’t have enough “push” to get the dog away before turning back. A Tandem is only successful when the dog believes in the turn. It must be convincing, and compelling. Oh, one final detail worth mentioning. The Tandem Turn “creates” distance. It’s a great movement to use to open up the real estate between dog and handler. 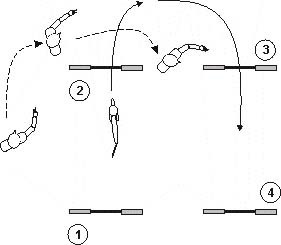 In this illustration the handler is working parallel to the dog over the first two jumps with a bit of lateral distance. At the “corner” the handler surges into the turn showing the arm signal for the turn. To the dog’s point of view the handler is making the turn; and the dog frankly won’t know until after jump #3 that the handler did not attend. It doesn’t matter. The dog should work faithfully in a path parallel to the handler to get to jump #4, even at a substantial distance. I’m actually busy on a lot of fronts these past few days. There’s a bunch of stuff that I can’t share on my blog (not quite yet). These are tough days for other reasons. Marsha’s father passed away about a week ago. And I don’t really want to talk about the goings on as a public matter. Cedar is getting her two-a-day training. Her “distance” training is bringing us to the point that we’ll have to take her out of the basement and to the training building (or out to the lower field if this really nice warm weather lasts much longer). Though she’s only five months old this is an important time in a dog’s life to build some great behaviors that she will own for her whole life. By this time next year we’ll be filling out her very first trial entries! It’s funny that it’s a whole year away. It sounds like a lot of time. But it’s not so much when you consider that there’s so much to do. I used to be a for real NFL football fan. I’m thinking that Michael Vick took that away from me. He was like a complete scumbag that horribly mistreated dogs in his care. I know that he “paid his time.” I resent that he can crawl out of prison and earn millions as a professional football player. On a morning sports talk show I remember a group of expert pundits, so called, sitting around a table, talking about Vick. One of them said “You’ve got to admire that he was a stand-up guy and didn’t roll on anyone else!” That means he didn’t expose the other scumbags who were out enjoying their vicious sport. The idea that the NFL would allow Michael Vick into their league… that the NY Jets would take this man reflects so poorly on them. Since he got out of prison he’s been a complete lowlife as a player. He doesn’t prepare for his games and doesn’t care if his team wins or loses. He just shows up and cashes his check. That’s what kind of man he is. Both the Jets and the NFL got what they deserve out of this scumbag. The proliferation of sports talk shows is really kind of a grind. You tune into these things to hear who’s going to win and lose upcoming games. And to the credit of these “experts” they manage to be right about 50% of the time. Did you see the trilogy of Hobbit movies? What did you think? Tomorrow I want to chat about them. You are currently browsing the archives for the Cedar Shakes the Woof category.